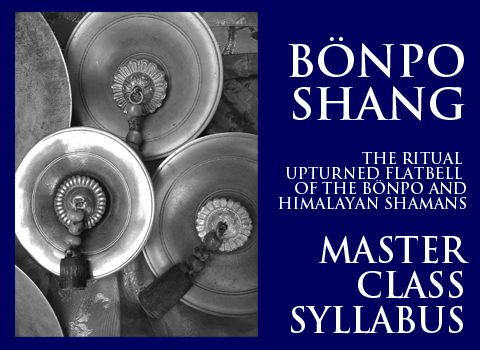 The Bonpo Shang is one of the world's oldest shamanic Sound Tools, and quite possibly the oldest metal sound tool, predating the gong. It's history dates back to the ancient kingdom of ZhangZhung, and is mentioned in writings attributed to the founder of Bon, Tonpa Shenrab. The instrument existed at the time of Lord Shenrab ( 18,000BC according to some historians ), and may be considerably older according to sources in the Bon community. The instrument is found in other shamanic traditions in the Himalayas, Tibet, Bhutan, Yunnan, Tuva, Mongolia,and as far north as the Buriyat Republic. This is the most comprehensive training program on this instrument in the world today. 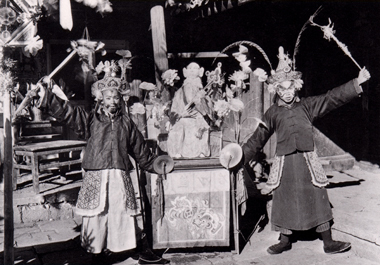 The program covers the uses and knowledge contained with the Bonpo culture, and then extends further into the shamanic uses by the lha-pa, dpa-mo, and lha-beb priests; as well as the uses by the Bomba, Paju and Naxi. The Shang is an incredible sound tool in the hands of someone who has been trained and tutored in the ways of this instrument. Do not confuse this program with any other program in the world today. Program Note: This is a serious and rigorous training, and students will be required to engage these studies with a deep commitment and a studious behavior to learning traditional teachings. Entry into this program requires instructor approval, and students may be dismissed from this program for failure to comply to the requirements at any time. Serious students should email the Academia, if they wish to pursue training in this instrument. * Instructor Message: This will be an intense and serious training following Eastern protocols. Students will be required to work long hours on this instrument. This is the most serious training on any instrument I offer. This is a 'no messing around ' type program that will push your dedication to learn. This will probably be the most intense and restrictive workshop retreat you will ever engage.